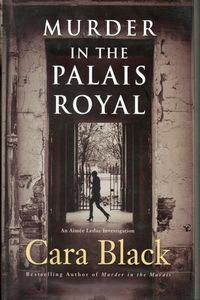 Murder in the Palais Royal by Cara Black: Synopsis and Online Purchase Options. Synopsis (from the publisher): Her partner, René, has been shot, and eyewitnesses have identified Aimée as the culprit. A mysterious deposit has been made to their firm's bank account, interesting the taxman in their affairs. Someone seems to be impersonating Aimée; someone wants revenge. Two murders ensue. How do they relate to the youth whom Aimée's testimony sent to jail in the very first Aimée Leduc investigation, Murder in the Marais?